Heat oven to 400°F. Unroll dough on ungreased dark nonstick cookie sheet. Press into 15x10-inch rectangle. Bake about 8 minutes or until lightly golden brown. Top with pizza sauce, half of the cheese, the ham, pineapple and remaining cheese. Bake 10 minutes longer or until crust is deep golden brown and cheese is melted. Cool 5 minutes before serving. Not a fan of pineapple on your pizza? Swap out the pineapple for chopped green bell pepper or mushrooms. Ah, yes, the classic debate. Does pineapple really belong on pizza? 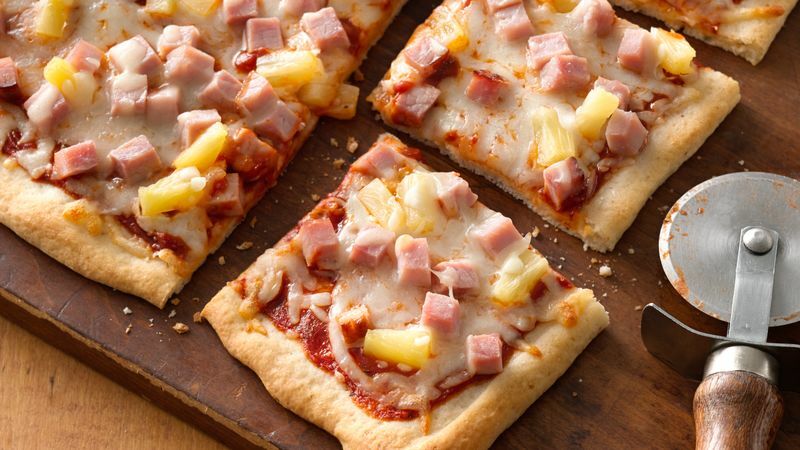 We’ll let you be the judge after trying this delicious Hawaiian pizza recipe. But, because you’re making it at home, we won’t judge you if you substitute mushrooms or chopped bell peppers for the pineapple. According to Time, the Hawaiian pizza was invented in 1962 by a man named Sam Panopoulos, a native of Greece who ran a pizza place in Canada. Panopoulos told BBC that the pizza had begun as an experiment, but that he and his brothers enjoyed the contrast between the pineapple’s sweetness and the savory flavor of the ham. Once you’ve had your fill of pineapple and ham, browse our other pizza recipes for ideas like Classic Margherita Pizza or Bacon Alfredo Pizza.